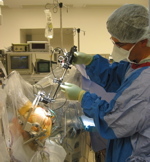 Home For Patients Deep Brain Stimulation Information What Kind of Commitment Does DBS Require From the Patient, Family, and the Implanting Center? Each patient who receives DBS for the treatment of a movement disorder has knowingly or unknowingly made a huge emotional and physical commitment. Not only has the patient devoted a large amount of time, energy, and travel for pre-operative screening and appointments, but there is an even larger commitment post-operatively. There will often be a need for follow-up brain scans, device checks, and post-operative care. There will be multiple DBS device adjustments especially during the first six months, and continuous management of medications. There is now additional information available for patients and practitioners, that have been published as part of the North American Survey, undertaken by the DBS society(13). This survey which included more than 4000 DBS procedures indicated that there was a significant number of post-operative visits necessary for DBS programming, especially in the first 6 months following the procedure. The battery life may be as short as 6-8 months in some disorders (e.g. dystonia), or as long as 5-6 years in others (e.g. essential tremor). There may not be adequate local expertise for follow-up programming or device related complications and this may require the patient to travel long distances for each visit. Patients who receive DBS should be prepared to make a large commitment of time, energy, emotional, and financial resources. There will be a new ongoing relationship for every patient who decides to become “bionic,” whether there is local DBS programming support or not. Question #7 – Should All Centers Perform Deep Brain Stimulation, and Should Care be Regionalized?